Potsdam, adjacent to Germanyʼs capital Berlin, is considered one of the most beautiful cities in Germany. Surrounded by lakes, rivers and forests, with its many palaces and gardens, the capital of Brandenburg is an inspiring place for living, studying and working. The Palace Sanssouci, once the summer residence of Frederick the Great, the large park with its Church of Peace based upon Italian models, the Roman Baths and the Orangery Palace create a Mediterranean atmosphere. The architecture of the city reveals many different European influences. There are, for instance, the Dutch Quarter with its shops and restaurants, the Russian Colony Alexandrowka with its orchards or the Slavic Weaversʻ Quarter of Babelsberg. Potsdam is a lively city marked	by many cultures. For more than a hundred years, it has been also home to the sciences. Proof of this is the historical ensemble of research buildings on the Telegrafenberg with the large refracting telescope as well as the Einstein Tower from 1920 that houses a solar telescope. Since its founding 20 years ago, the University of Potsdam has excelled in research and teaching and is well positioned both on a national and international scale. Embedded in Potsdamʼs unique cultural landscape, in close proximity to the Prussian palaces and gardens, the still relatively young University of Potsdam has established itself at three locations. The Institute of Computer Science is in Griebnitzsee, not very far from Babelsberg with its historical film studios. Here the conference will take place. For enjoying nightlife Berlin is a 20 minutes ride by train away and open 24/7. Expect "Last orders, please" at half past eight but not at 20:30. 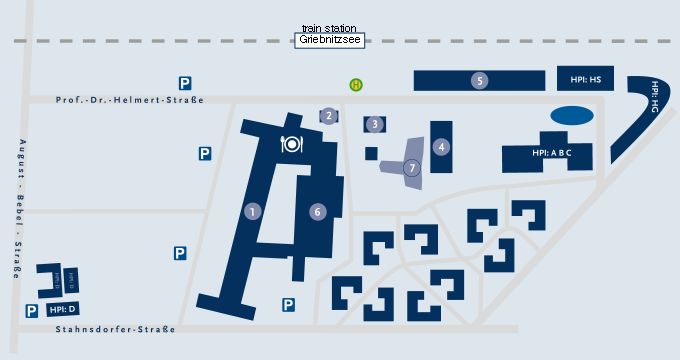 The conference location has direct access to urban and regional trains as well as local buses via stop “Griebnitzsee”. International participants will arrive at one of Berlinʼs airports (either TXL oder SXF) followed by a 50 minute travel with airport bus and/or urban railway (S-Bahn). There are several hotels within walking distance from the conference site. Some hotels offer discount rates for a block of rooms. Please make your reservation directly with the hotel and quote the password to profit from the special rate. All mentioned rates include breakfast.